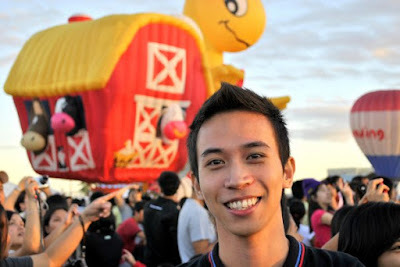 Finally, I was able to upload the most awaited photos from the 15th Philippine International Hot Air Balloon Fiesta in Clark Freeport Zone, Pampanga last Saturday, February 13th. We came in as early as 5 in the morning to avoid the large volume of traffic in Clark. It's one of our lessons learned from last year's Hot Air Balloon Festival: we got stuck in traffic, and when we reached the destination, the hot air balloons already took off. So this time, we bought the tickets few days before the event and hit the road by dusk. It was a fruitful effort, for the record, because we were able to see the balloons closer and better. During the event, there were also some street dances and performances from the Ibon-Ebon Festival of Candaba Pampanga. You can view more photos from the event on my multiply site.